COVERLAB Analytics is a web-based data visualization decision support system that helps the Motor Carrier Enforcement (MCE) section of the North Carolina State Highway Patrol (NCSHP) improve its tactical enforcement planning for reducing truck-involved fatal crashes and protecting road/bridge infrastructure from heavy truck damage. 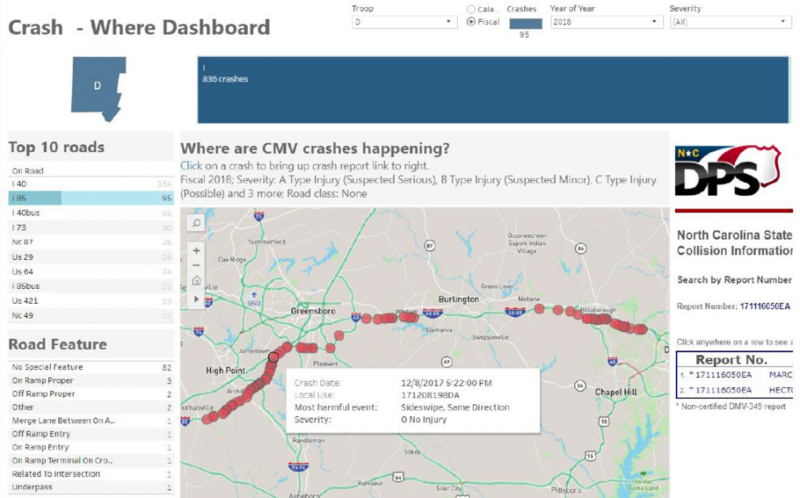 Geospatial (map) analytics allows users to easily filter and map CMV crashes, inspections, and citations by location, time, contributing circumstances, and many other variables. Patrol supervisors can see where crash patterns are located relative to enforcement activities, allowing them to visualize relationship between existing enforcement activities, areas, and times where safety and infrastructure protection concerns are greatest. FMCSA and FHWA requires states to develop goals and strategies for reducing truck crashes and protecting infrastructure. Federal data reporting tools are tailored to the broad state level, so do not provide states with necessary granularity to generate effective data-driven, troop-level enforcement strategies. North Carolina’s approach has been to drive operational enforcement goals and objectives down to the individual troop level, and to develop intelligent strategies for troop supervisors to use local data to create troop-specific enforcement plans. This troop-level planning approach is critical to flexible and effective enforcement planning. Each troop is uniquely different and demands different strategies for maximizing resource effectiveness. Much like a company needs to align business objectives with performance goals, CMV enforcement programs can align enforcement objectives with performance goals. Individual troops are akin to business units in a company, where success is measured by individual performance against the collective goals of the parent state. Moving enforcement planning to the troop-leader level makes good “business sense” by giving both administrators and troops simultaneous ability to monitor performance and identify gaps and successes in troop performance. This “bottom-up” approach has the net effect of improving the nation’s performance by more effectively enabling each state’s ability to meet these goals. 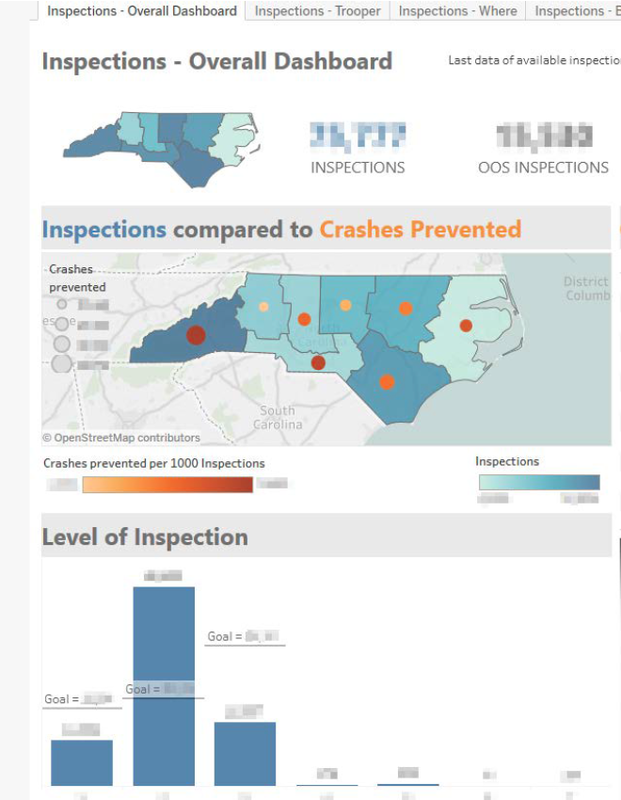 COVERLAB receives CMV crash, citation, inspection and roadway data from NCDOT, NCDMV and NCSHP. 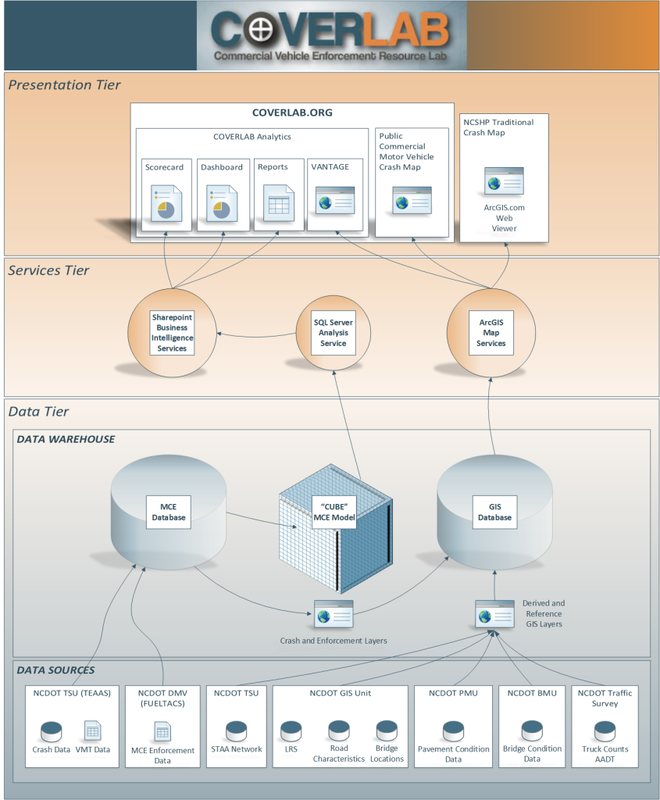 These data are geo-located, ingested into a data warehouse, and exposed through interactive online web services. Users log in to COVERLAB Analytics thru the coverlab.org gateway. COVERLAB staff train MCE staff on how to effectively use COVERLAB decision support technologies. Our staff also work closely with each Troop’s operational planning supervisors to translate field operations knowledge to improve COVERLAB Analytics.